TriTek Fungicide Miticide Insecticide The proven leader in pesticidal performance and reliability, TriTek is a unique concentrate of pre-emulsified highly refined, high paraffinic, low aromatic oil. TriTek provides effective pest and disease control in a broad range of crops and ornamentals without causing burn or stress to plants. TriTek is OMRI listed and meets, and even exceeds, most worldwide standards for agricultural spray oils. TriTek Fungicide Miticide Insecticide controls a wide range of insect pests in the egg stage such as: spider and eriophyid mites, armored and soft scales, mealy bugs, psyllids, whiteflies, aphids, leafrollers and adelgids. TriTek Fungicide Miticide Insecticide will kill other imature forms if spray covers the insect. Spray Oil Emulsion Insecticide, Fungicide and Miticide Controls Aphids, Mites, Scales, Whiteflies and Other Insects. 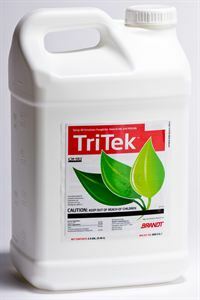 TriTek is a spray oil and has the one of the lowest toxicity levels of any pesticide on the market. It is considered an organic pesticide and is OMRI Listed. TriTek Fungicide Miticide Insecticide is an organic alternative that be used on most fruits and vegetables, as a dormant spray and as a summer oil spray. Proven leader in pesticidal performance and reliability. Unique concentrate of pre-emulsified highly refined, high paraffinic, low aromatic oil. Provides effective pest and disease control in a broad range of crops and ornamentals. Tritek droplet, 14 times smaller than conventional spray oil droplet. Can be used effectively in combination with other synthetic pesticides or insecticidal soap. When used in combination it acts as a spreader / sticker and as a penetrant. * FREE Saver Shipping within the contiguous 48 states. Triact 70 Fungicide Insecticide Miticide OMRI Listed 2½, 2.5 Gal. Triact 70 Fungicide Insecticide Miticide (clarified hydrophobic extract of Neem oil) is a broad-spectrum fungicide, miticide and insecticide that is OMRI Listed. Conserve SC Spinosad Insecticide is an excellent choice for turf and ornimental use. Pylon Miticide Insecticide, with the active ingredient chlorfenapyr, is a cost-effective, broad-spectrum product that provides exceptional control of key greenhouse pests.